On my way home from work at the Lowry Nature Center in Carver Park Reserve I saw three birds fly up from the edge of the nature center driveway. 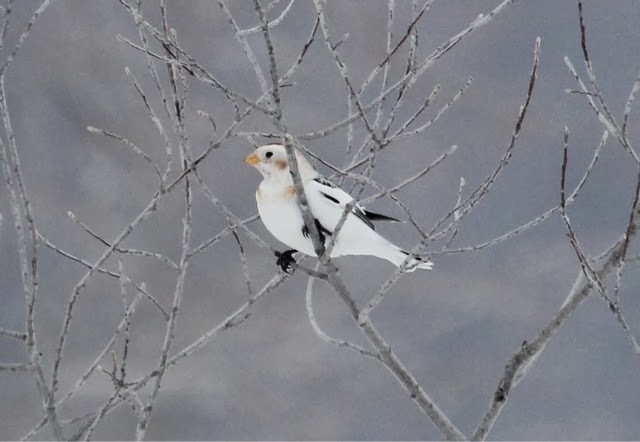 They were snow buntings! Unfortunately, I had neither binoculars nor camera with me. I grabbed my DSLR on the way out the door this morning and lucky me, the birds were in the exact same location this morning! I only managed to click off three photos before they flew away but it was fun to get a good look at these handsome birds. Very cool, Kirk. Never seen one.